Earlier in the week we sent our subscribers a report, which was later picked up by CNBC, on end of the quarter window dressing. The report concluded that the stocks which do best from the start of the quarter up until the start of the last week, will also outperform the market in the final five trading days of the quarter. So far Q1 2007 is shaping up to be no different, although given the markets weakness this week, the net result is that investors following this strategy will just end up losing less than than the market overall. 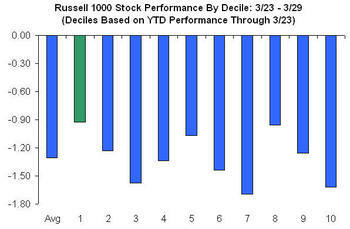 As the table below illustrates, the twenty best performing stocks in the Russell 1000 through 3/23 are down 0.46% through Thursdays close, while the average stock in the Russell 1000 is down 1.40%. In terms of deciles, we end up with a similar scenario. 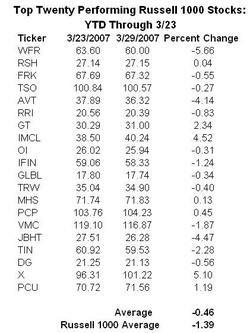 The group of stocks with the best performance up through 3/23 (decile 1) has outperformed every other decile in the final four days of the quarter. The Baltic Dry Freight Index is considered by some to be a decent indicator as to the future direction of the economy. The logic goes along the lines that if shippers are busy and therefore raising prices, it must be a sign that the economy is strong. On the flip side, falling prices for shipping services indicates that business for shippers, and ultimately the economy, is weak. Without getting into the debate over the reliability of this tool, we recently saw that y/y shipping rates are up over 100%, which seems to counter some of the fears out there that our economy is getting too soft. While moves of this magnitude are not rare, it certainly does not indicate that business is slow for shipping companies involved in moving freight. 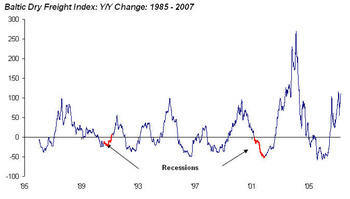 The chart below, graphs the y/y price change in the Baltic Dry Freight Index with recessions marked in red. Note that neither recession of the last twenty years occurred when the price change of the Baltic Dry Index was at similar levels. Conversely, while both of the recessions of the last twenty years were preceded by declines in this index, like economists, this indicator has predicted seven of the last two recession (i.e. not every downturn in shipping rates is a sign of impending recession. 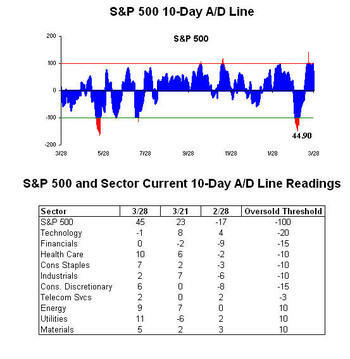 One of the features of our mini-institutional research product is the Daily S&P 500 and Sector 10-Day A/D Line. At the end of each day, we calculate the net number of S&P 500 stocks that were up on the day (up stocks minus down stocks). Then we add up each of those daily values over the last ten days to come up with the chart below. Whenever the reading gets too high, it indicates the market may be due for a pull back, and whenever it gets to low, it indicates the market may see a bounce in the near future. Last week, we highlighted how the reading for the S&P 500 was the most overbought it has been since November. Well after two relatively lousy days this week, we revisited where the 10-Day A/D line stands for the market and each of its sectors. Unfortunately, as the chart and table below highlight, the market itself (and most of the sectors) are all currently in neutral territory. While the market can certainly rise from these levels, the risk reward based on this particular indicator is neutral. Looking forward, these reading are likely to continue staying in neutral territory until at least the middle of next week when we drop off some of the big up days from last week. Yesterday afternoon, Ticker Sense's Paul Hickey was on Street Signs with Erin Burnett. The topic of the conversation was end of the quarter window dressing by portfolio managers, and Paul highlighted some key stocks. The video can be seen here. 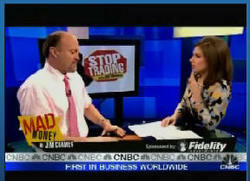 Afterward, Jim Cramer was on with Erin Burnett and they started off by discussing our list of stocks. It was nice to hear Mr. Cramer's remarks about Paul's work: "He's so right, and I've always thought that Birinyi's work is just magnificent." It is always nice to receive a compliment like that. 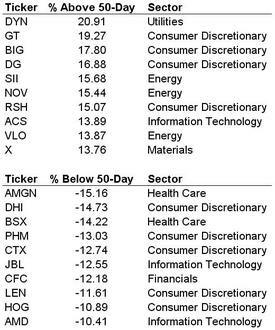 Below we list the S&P 500 stocks that are furthest above and below their 50-day moving averages. Goodyear Tire (GT), up 50% this year, has continued to climb during the recent shakiness in the markets. Five of the 10 stocks that are furthest below their 50-days are housing related stocks. Amgen (AMGN) is the most oversold at 15.16% below. There are 18 S&P 500 stocks that have now been up for 5 or more consecutive days. CB and DVN top the list at 10 consecutive days. This hasn't happened for either stock in the past 4 years. A is currently up 8 days in a row, and interestingly, of the 4 prior times this has happened, it has gone up for a ninth day. 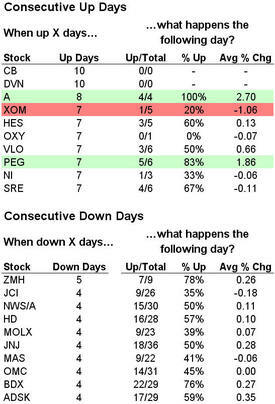 XOM, on the other hand, is up 7 days in a row, but it has only gone up for an eighth day 20% of the time. On the down side, ZMH is the only stock down 5 days in a row. Of the 9 times this has happened in the past 4 years, the stock has reversed and gone up on the sixth day 7 times. We wanted to see how well the pre-market futures have been able to predict the market's performance from open to close on a daily basis. To do this we took the change in the S&P 500 tracking SPY ETF from the prior day's close to that day's open (representing the change in pre-market futures) and compared it to the change in SPYs from the open to the close that day. We then calculated the correlation between the pre-market change and the open to close change over the past 3 months and rolled it on a daily basis going all the way back to when the SPYs first started trading in 1993. Our first finding is that the the correlation has been negative 65% of the time, meaning the tendency is for the market to move in the opposite direction from the futures during normal trading hours. 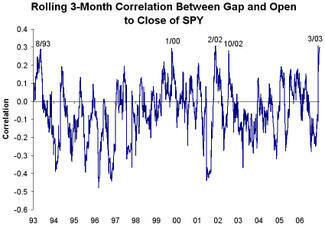 Our second finding is that the correlation over the past 3 or 4 months is at high levels that have only been seen on four other occasions since 1993 -- 8/93, 1/00, 2/02 and 10/02. Ticker Sense's Paul Hickey will be on CNBC's Street Signs with Erin Burnett today at 2:00 PM ET. Today he'll be discussing end of the quarter window dressing.